When it comes to docking stations for the iOS-powered range of devices, these are dime a dozen. In fact, dime a dozen does not really describe it best, it would be a gazillion iDocks hanging around on store shelves, looking pitifully at the masses who walk by each day, hoping that someone would rescue them from such a mediocre existence so that they can really show off to the listener just what kind of audio performance they are capable of. Well, the $25.99 Boom Dock iSpeaker does not need to rest on a store shelf, as you can always make an online purchase and have it delivered right to your doorstep. 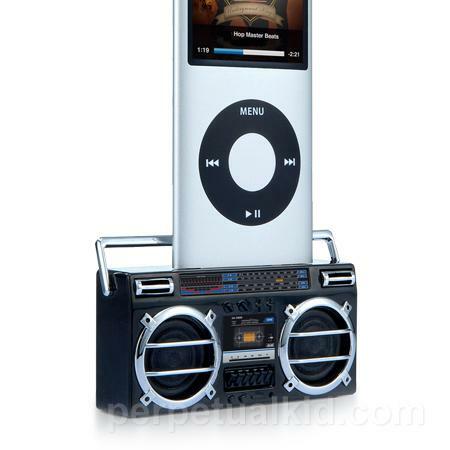 Apart from that, it also comes in a shape of a boom box, meaning you can relive those old school moments of your youth as you blast current tunes via a retro looking device. As for old faithful, you might as well send it into retirement and perform an upgrade by picking up the (relatively lightweight) Boom Dock iSpeaker. It allows you to tote the boombox around without having to struggle much, and you also need not sacrifice your sense of musical style. Be mindful though, the Boom Dock iSpeaker will rely on power from your connected iDevice, meaning it has no batteries built in, but your iDevice will be sucked dry faster than normal. It will play nice with the iPod mini, classic and 3rd to 5th generations, iPod nano 1st to 5th generations, iPod touch, iPhone and iPad.